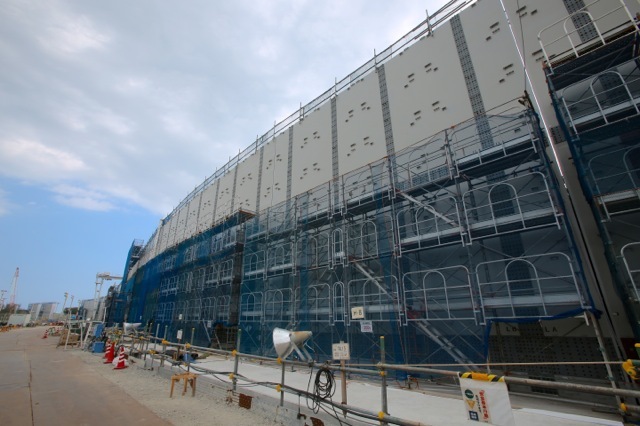 The scale of work is tremendous, such as the 18-meter high tsunami prevention wall or the seawall . 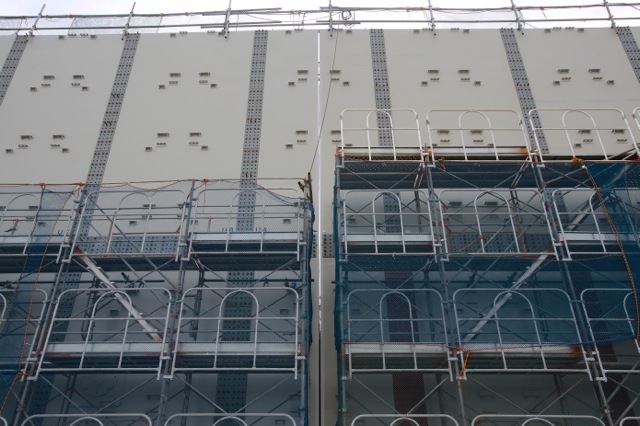 Under the motto “Hearts and strengths united,” a work force of 4,000 assembled from Chubu Electric Power employees and associated companies is stepping up its efforts for the safety enhancements. Yet there are no assurances from the government that the facility can restart operations. In fact, the interference from politicians has heavily burdened the company, whose costs will eventually be borne by the users. Why is such an absurd situation allowed to remain unattended? The future outlook for energy is considered through the case of Hamaoka Nuclear Power Station. 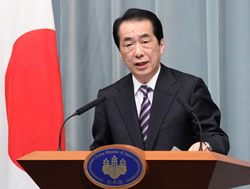 Last year on May 6, then-Prime Minister Naoto Kan made this announcement at a hastily convened press conference. The reason was the high possibility of a Tokai Region earthquake. At the time, society was overcome with fear over nuclear power plants and earthquakes immediately after the TEPCO Fukushima nuclear accident. Some people greeted this announcement with loud applause. The Prime Minister had no legal authority to shut down the nuclear power plant, so Mr. Kan used the term “request.” But no company could spurn that. Chubu Electric Power acquiesced. “We have placed efforts continually on safety for coexistence and mutual prosperity with the local community. The request by Prime Minister Kan last year felt like a sudden and complete denial. It was a tremendous shock and humiliation,” explained Ryosuke Mizutani, Director and Senior Managing Executive Officer of Chubu Electric Power. 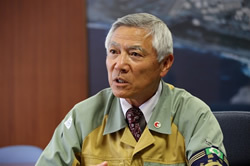 Mr. Mizutani is also responsible for the operations of Hamaoka Nuclear Power Station as Hamaoka Central Administration General Manager. Society in Japan fosters a healthy work ethic that calls for benefits to both the public and the personal. Hearing Mizutani’s words, the author remembered this and gained respect for him. Adhering to the idea of “on behalf of society,” the company’s employees were reflecting on their own corporate activities in relation to society, and took the autocratic actions of the politicians without criticism, from senior executive to line employee, as an opportunity for self-change. Subsequently, Chubu Electric Power embarked on massive work to enhance the safety of Hamaoka Nuclear Power Station. The helmets of on-site workers are emblazoned with the stickers “Hearts and strengths united.” In the conference room at the administrative offices, a traditional message paperboard from President Akihisa Mizuno reads, “We can’t stand to lose. Aim for Global No. 1.” Morale of the employees is high; the determination and resolve of Chubu Electric Power are evident. 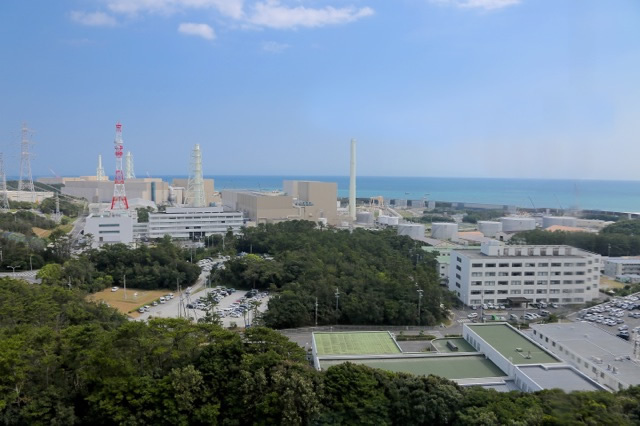 Commanding a works budget of 140 billion yen, Chubu Electric Power plans to complete safety enhancements such as tsunami and earthquake countermeasures by December next year. The scale is tremendous. In the Fukushima nuclear accident, the operating nuclear reactors were able to complete emergency shutdowns, but tsunami destroyed the cooling system using seawater and the reactors overheated. Not only were the reactors damaged, but also leaking hydrogen exploded. The calamity has triggered nationwide work on tsunami countermeasures at nuclear power plants, but the thoroughness at Hamaoka is extraordinary. Hamaoka Nuclear Power Station faces Enshunada, a coastal stretch of sea between Shizuoka and Aichi Prefectures that goes out to the Pacific Ocean. Leveraging the natural landscape, a dune embankment was established with a breadth of 60 to 80 meters and height of 10 to 15 meters above sea level. The safety enhancement work this time augments this embankment. Three stages of additional tsunami countermeasures are in progress. The first is flooding prevention of the site. Behind the dune embankment, a massive seawall is under construction along an extended oceanfront run of 1.6 kilometers, rising 10 to 12 meters above ground and made 2 meters thick. A foundation 15 to 40 meters deep underground supports the seawall, and can withstand the force of tsunami. The top of the wall is approximately 18 meters above sea level. The enormity brings the Great Wall of China to mind. In addition, prevention of flooding into the reactor buildings has been implemented. Major entrances have double doors that are waterproof. “Critical areas can be sealed like a submarine,” according to Chubu Electric Power personnel in charge. Combined ingenuity is at work to maintain reactor cooling under any set of circumstances. 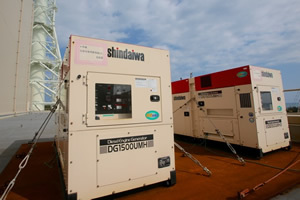 Power generators as the source of emergency power in a disaster are placed at the intermediate height of reactor buildings. 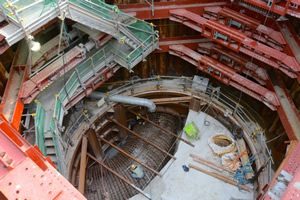 A gas turbine generator and storehouse for emergency supplies and equipment are under construction 40 meters above sea level on a high ground. Portable power pumps are on-site in the event of power loss during a disaster, and have also been housed on the high graound. Hamaoka Nuclear Power Station also draws seawater for cooling. As preparedness against flooding that affects the outdoor seawater intake pumps, other pumps with the same capacity will be installed inside the waterproof building with an underground water cistern. The emergency intake facility from a nearby river that was previously in place is been planned to be upgraded also. This year on August 29, Central Disaster Prevention Council of the Cabinet Office held its study group on the Nankai Trough massive earthquake model, and released its compiled estimates (second report). The forecast presented the possibility of a seismic intensity of 7 and maximum tsunami height of 19 meters along the coast of Omaezaki. Even if a 20-meter class tsunami threatens, Chubu Electric Power personnel do not foresee the possibility of nuclear reactor destruction or plant destruction to the extent of cooling failure caused by tsunami clearing the four stages of defense that include the dune embankment. Moreover, under a total loss of supplied power like the Fukushima nuclear accident, the power station can cool the nuclear reactors with its own generation capacity for one week. 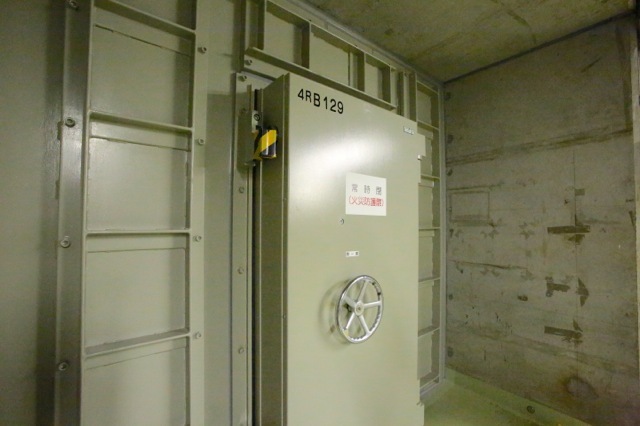 Chubu Electric Power has worked on earthquake countermeasures at Hamaoka as well. Fukushima Daiichi Nuclear Power Plant experienced tremors of approximately 670 gal (unit of shaking intensity). 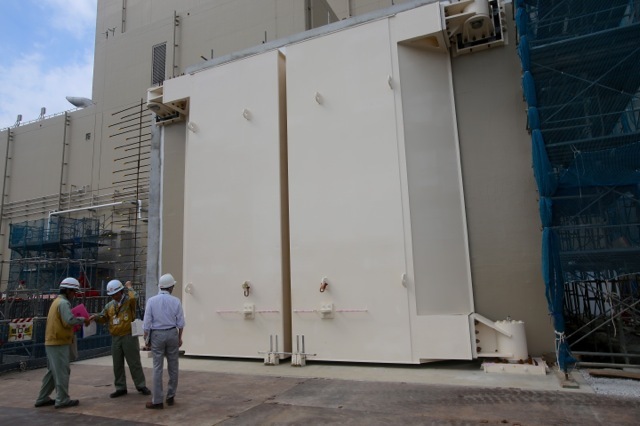 The government asked Hamaoka Nuclear Power Station for safety standards that envisioned 800 gal tremors, but Chubu Electric Power responded with a greater seismic resistance target of 1,000 gal, and completed the work in 2008. Located in central Shizuoka Prefecture, Hamaoka Nuclear Power Station began operations in 1971. Of the five nuclear reactors, No. 1 started operations in 1976 and No. 2 in 1978. These two reactors ceased operations in 2009, and are in the process of decommissioning. No. 3 (started operations in 1987), No. 4 (1993), and No. 5 (2005) are relatively new in their operation life cycles with enhanced designs for safety. Hamaoka is the only nuclear power-generating facility belonging to Chubu Electric Power, and supplied approximately 20% of the company’s electricity through 2010. In many cases, the sites of nuclear power plants in Japan and the cities that use the capacity are distant from each other. The electricity generated at Hamaoka, however, is consumed mainly within Shizuoka Prefecture. Operations at Hamaoka underscore the local generation and local consumption of the electricity, and have promoted coexistence and mutual prosperity. Since the Fukushima nuclear accident, however, some parts of the community have been worried. Restarting Hamaoka Nuclear Power Station directly affects the business of Chubu Electric Power. Compared to consolidated ordinary income of 148.2 billion yen in Fiscal 2010, the company recorded an ordinary loss of income amounting to 67.8 billion yen and net loss of 92.1 billion yen in Fiscal 2011. The shutdown of Hamaoka accompanied by the increase of thermal power generation added 371.1 billion yen in fuel costs. Management efforts offset some of the increase, but profitability could not be achieved. At this point in time, there are no assurances of recouping the series of safety enhancements executed by Chubu Electric power. The new safety enhancements are voluntary, and not assessed by the government, which will authorize the restart. Everything depends on the government’s intent and local community understanding. Hamaoka Nuclear Power Station is at the mercy of politics. Saddled with the shutdown request last year, the facility has become symbolically significant as “the nuclear power plant labeled dangerous by a prime minister.” With criticism mounting over governance, former Prime Minister Kan resigned in September last year, and has since engaged heavily in anti-nuclear activities. He shows no regret over the Hamaoka shutdown, and repeats his belief that it was “correct judgment” whenever an occasion presents itself. 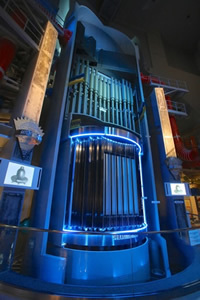 The government’s behavior over nuclear power is best described as “waffling.” In June, Prime Minister Yoshihiko Noda proclaimed the necessity of nuclear power to Japan’s future at the Oi Nuclear Power Plant (Fukui Prefecture), but ordered METI to study the challenges of a nuclear-power free future and how to overcome them in August. As the election of the House of Representatives (lower House of the Japanese Diet) allegedly draws near, politicians are increasing their “Zero nuclear power” calls, which seem to be electioneering performances. Amidst the political quagmire, the government agencies slow down in their action. The government is poised to establish the Nuclear Regulatory Commission as an independent government agency this autumn, with the Nuclear Regulatory Agency placed under it. This organization will determine the startup of operations for nuclear power plants, but the new safety standards are delayed in their development. The safety enhancements conducted by the power companies, including the work at Hamaoka, are voluntary efforts. The validation of the stress test as an additional safety measure set forth by NISA last year is also delayed. Government administration seems to be casting the nuclear power plants aside as they simply wait for public opinion and politics to play out. Having operated its nuclear power facilities without any major accidents, Chubu Electric Power is now sustaining an unreasonable burden. The situation goes beyond just one company. The nuclear power plants of all of the nation’s power companies are delayed in their restarts. 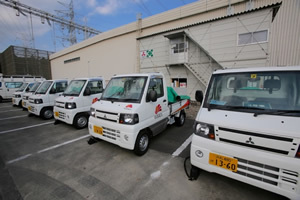 METI documentation shows extra fuel costs of 2.3 trillion yen in Fiscal 2011 over Fiscal 2010 as a consequence of alternatively sourced fuel related to the shutdowns of nuclear power plants across the nation. If all nuclear facilities continue to remain shut down in Fiscal 2012, the added fuel cost is estimated between 3.1 to 3.8 trillion yen. This cost of around 10 billion yen per day will eventually become a burden shouldered by all Japanese citizens in the form of increased electricity rates and an adverse impact to the economy. Many opinions are certainly divided over nuclear power. But everyone in their respective station needs to debate the restarting and the future of nuclear power plants by confronting the reality: People are working hard to support the stable supply of electricity, and the power companies and we face additional burdens. The current circumstances at Hamaoka Nuclear Power Station and the improvement work being conducted give us an important case to reflect on. Electricity does not flow freely, either like natural springwater, or with the press of a button. There is a cost. We can use electricity, because the people who work at the power companies enable its generation, transmission, and distribution. Considering the safety enhancements being made at Hamaoka Nuclear Power Station, the author believes that the government should authorize its restart at an early date, and economic losses of Japan should be mitigated through early restarting.